On January 19, 2017 at 5:30PM in each time zone across the country, members of the theater community-from Broadway to regional theaters to high schools and colleges and community theaters-will come together to launch The Ghostlight Project. Inspired by the tradition of leaving a “ghost light” on in a darkened theater, artists and communities will make or renew a pledge to stand for and protect the values of inclusion, participation, and compassion for everyone-regardless of race, class, religion, country of origin, immigration status, (dis)ability, gender identity, or sexual orientation. 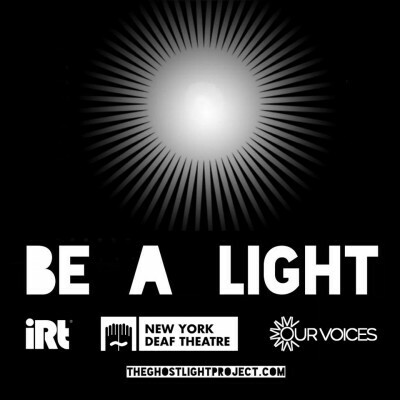 IRT Theater, New York Deaf Theatre, and Our Voices will come together with the common interests of advocating inclusion and diversity. We will gather inside IRT Theater (154 Christopher Street, Third Floor-3B) from 4:30-5:30pm with a 15 minute ceremony at 5:30pm sharp. No RSVP necessary. Just bring a light to shine-the flashlight on your mobile phone is perfect!